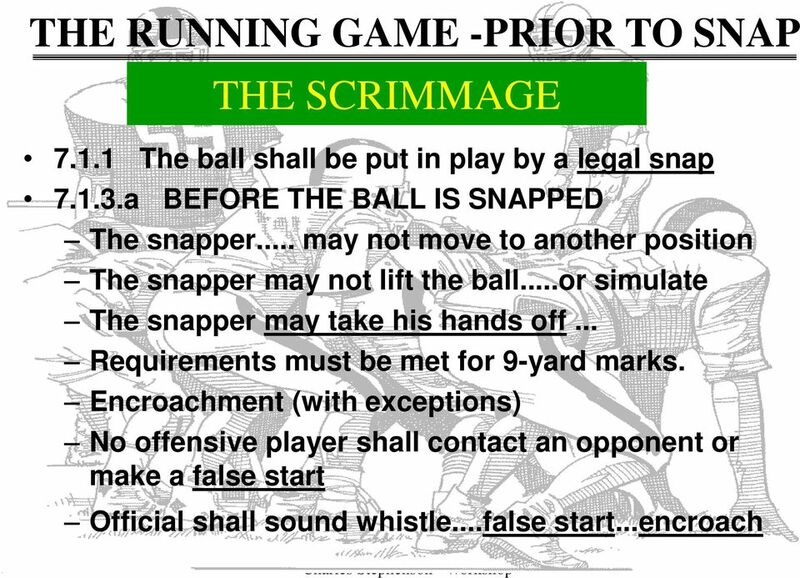 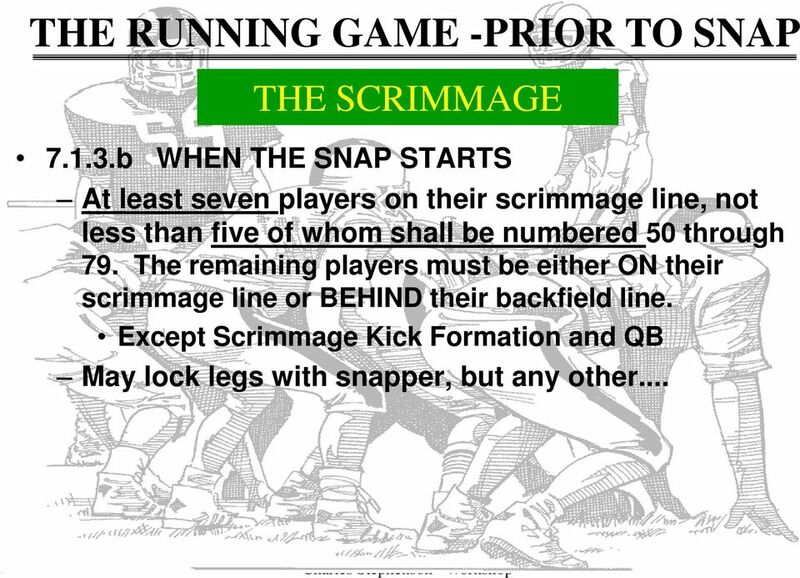 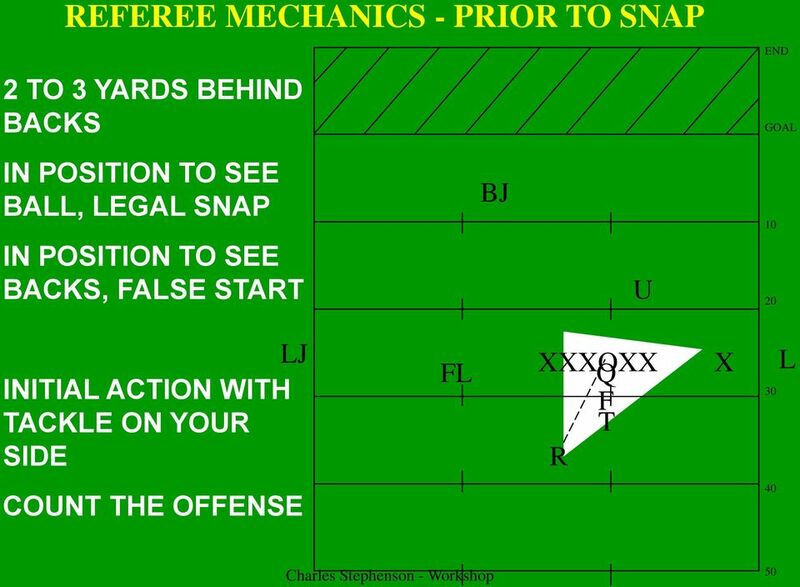 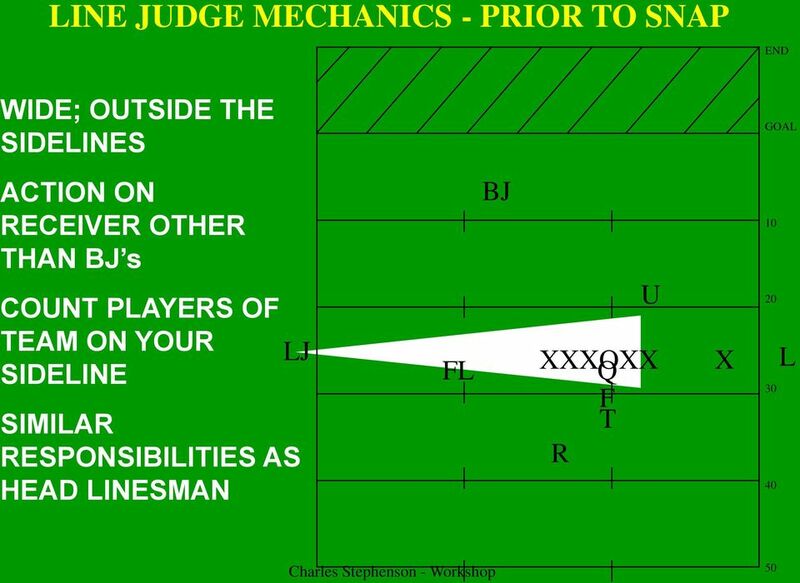 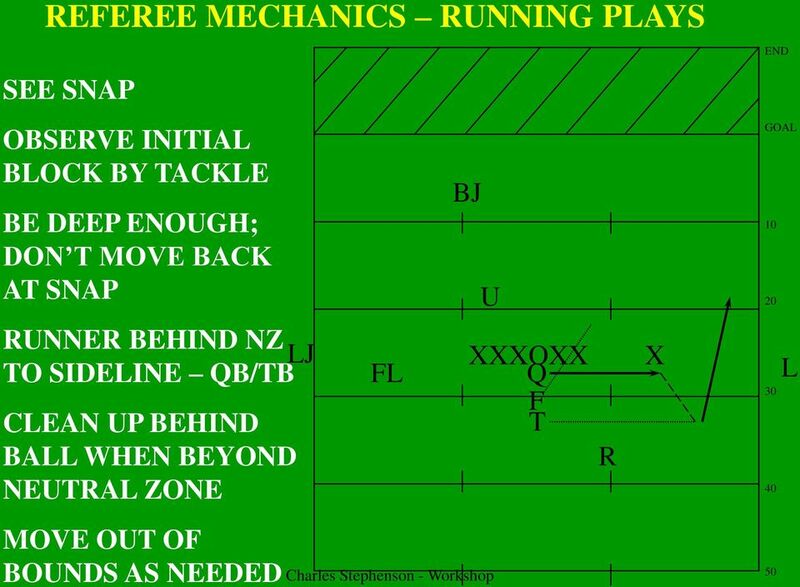 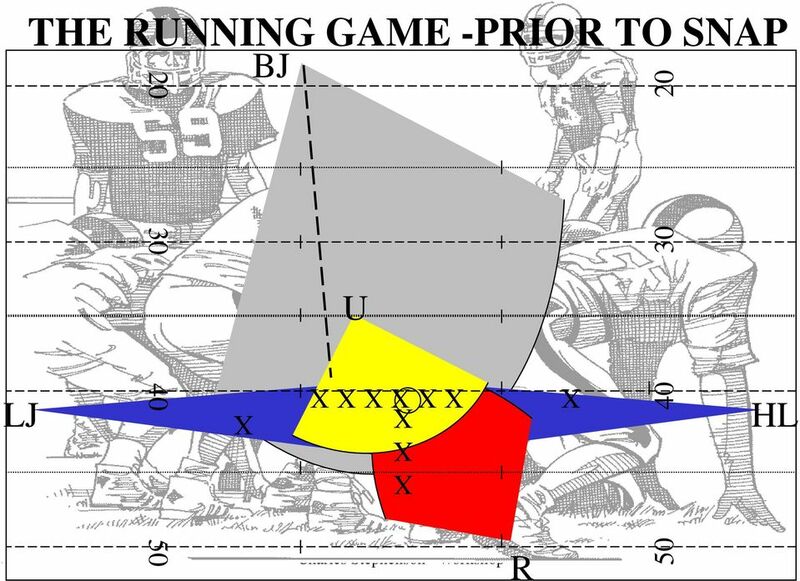 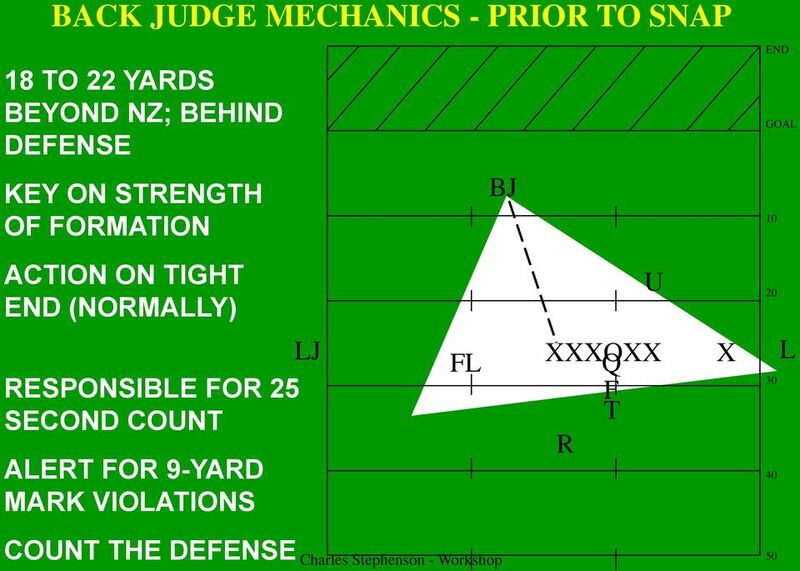 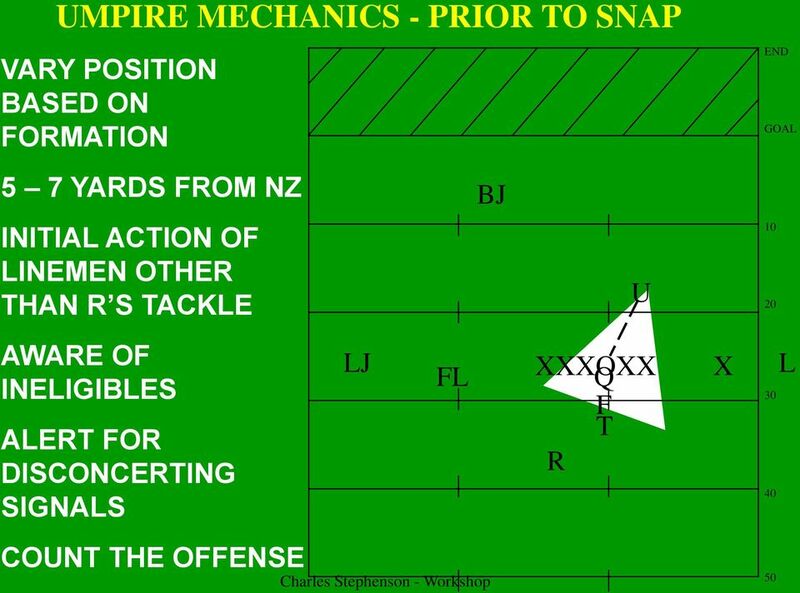 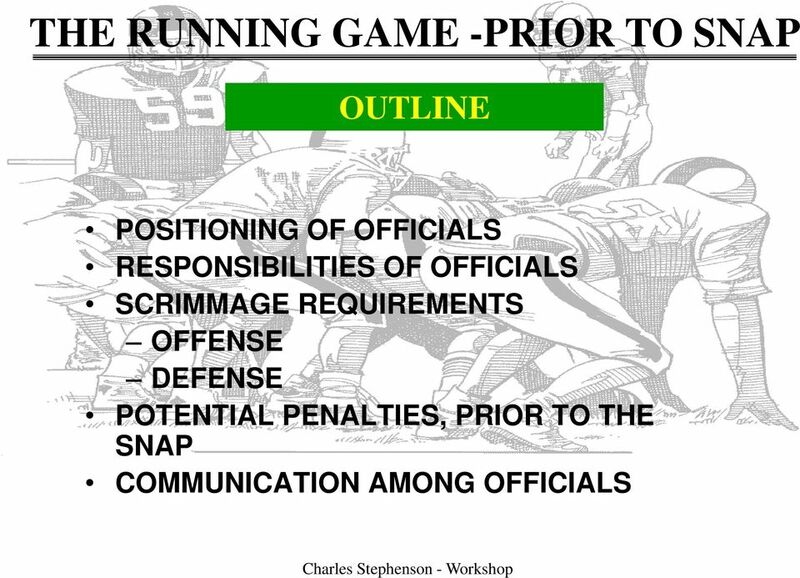 Download "THE RUNNING GAME -PRIOR TO SNAP"
11 THE RUNNING GAME -PRIOR TO SNAP THE SCRIMMAGE b WHEN THE SNAP STARTS All players must be inbounds, and only the snapper may be encroaching on the neutral zone, but no part of his person may be beyond the neutral zone... One player may be in motion, but not in motion toward his opponent s goal line. 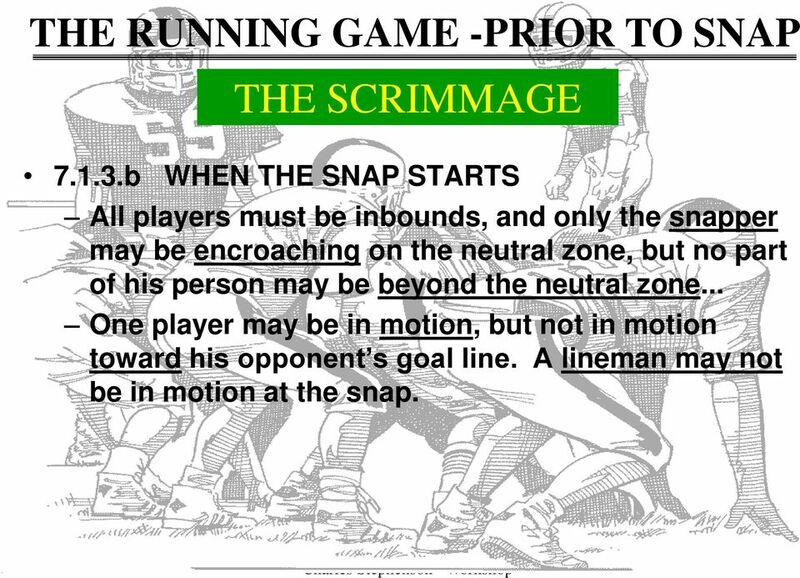 A lineman may not be in motion at the snap. 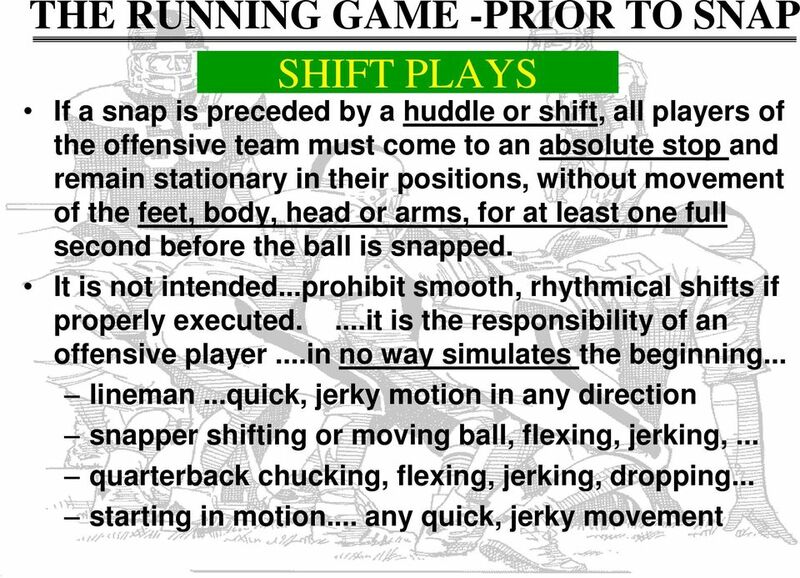 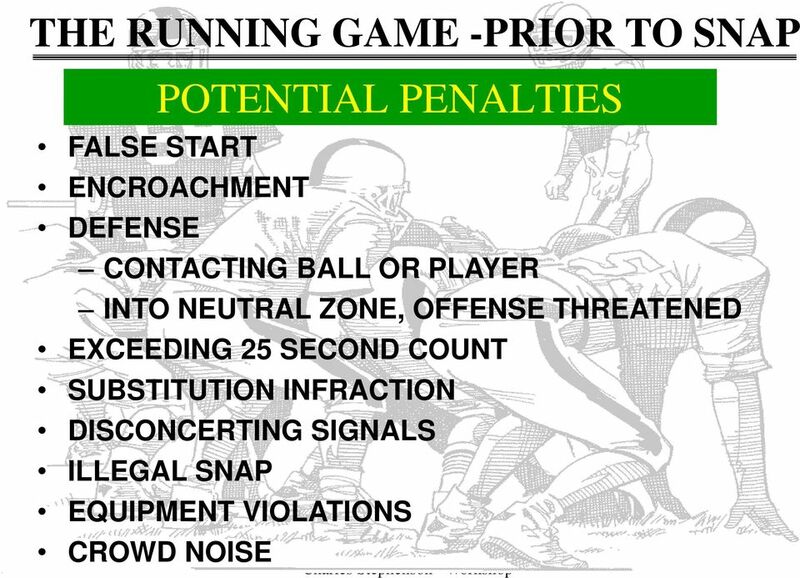 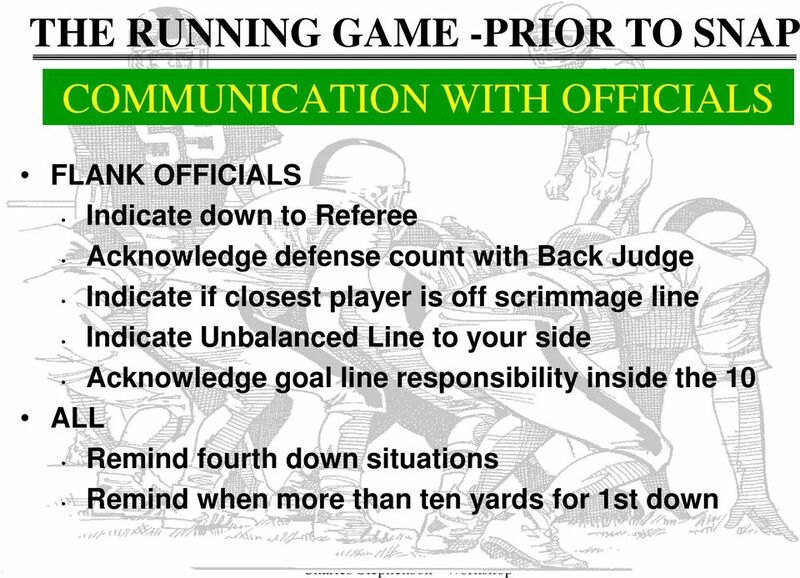 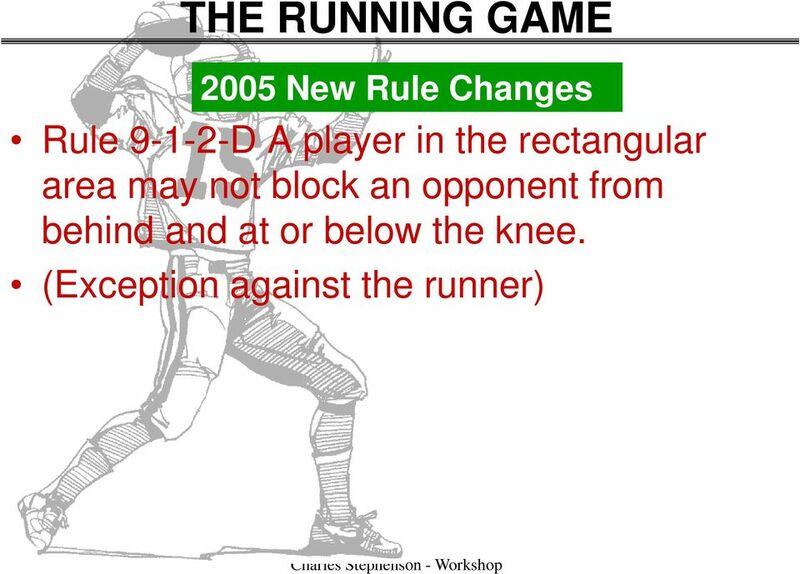 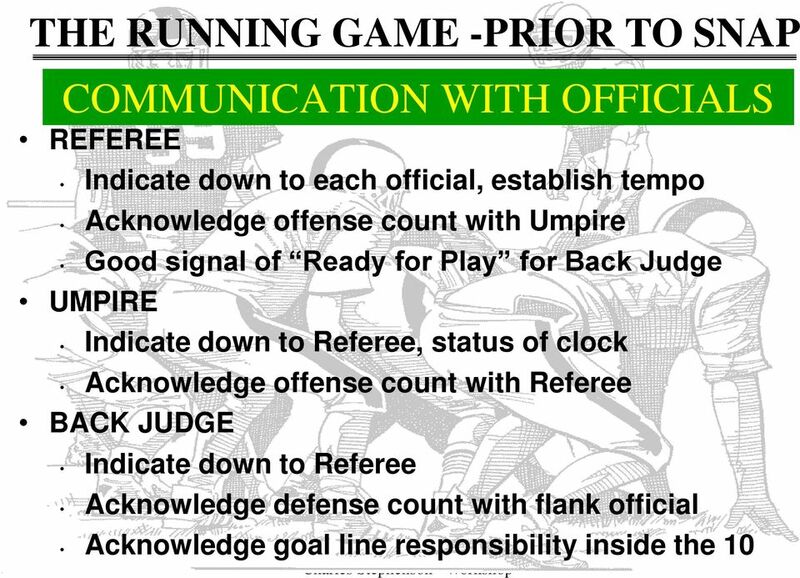 27 THE RUNNING GAME -DURING THE RUN HOLDING USE OF HANDS OR ARMS BY OFFENSE (9-3-3-b) HOLDING OR ILLEGAL OBSTRUCTION BY A TEAMMATE OF THE RUNNER.. 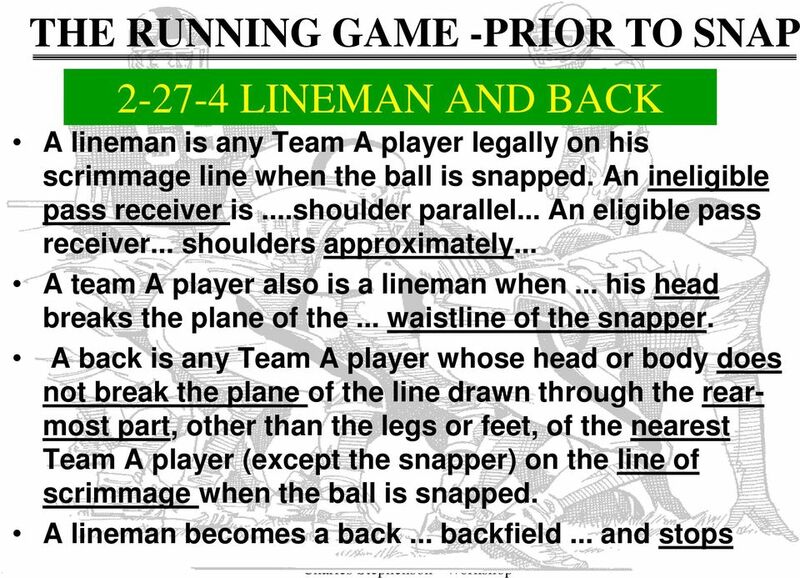 THE HAND(S) OR ARM(S) SHALL NOT BE USED TO GRASP, PULL OR ENCIRCLE IN ANY WAY THAT ILLEGALLY IMPEDES OR ILLEGALLY OBSTRUCTS AN OPPONENT. 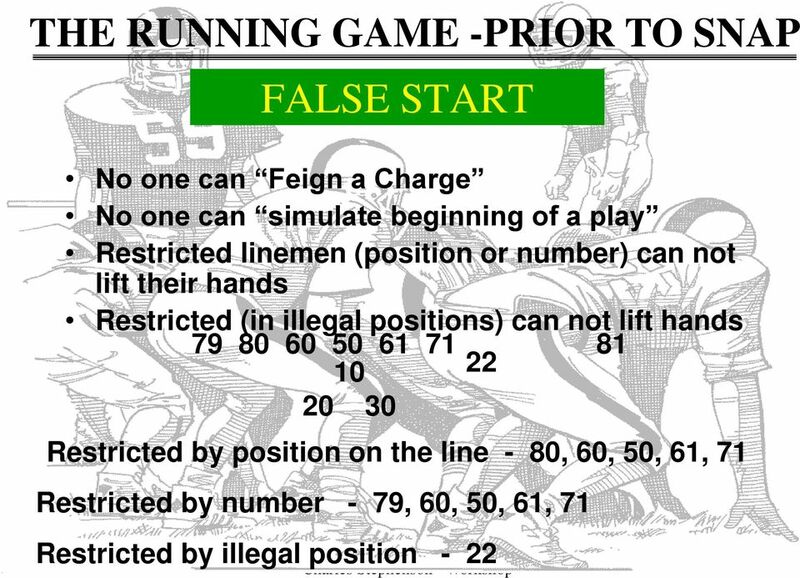 THE HAND(S) OR ARM(S) SHALL NOT BE USED TO HOOK, CLAMP OR OTHERWISE ILLEGALLY IMPEDE OR ILLEGALLY OBSTRUCT AN OPPONENT. 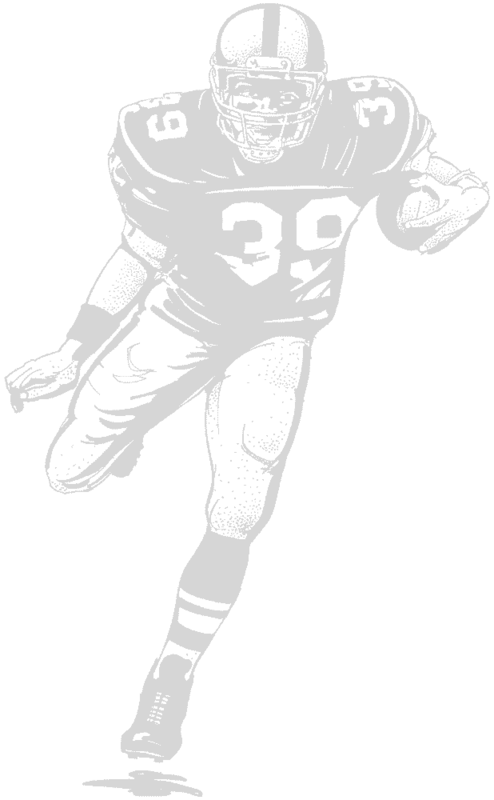 35 THE RUNNING GAME -DURING THE RUN NO PLAYER SHALL GRASP THE FACE MASK OR ANY HELMET OPENING OF AN OPPONENT. 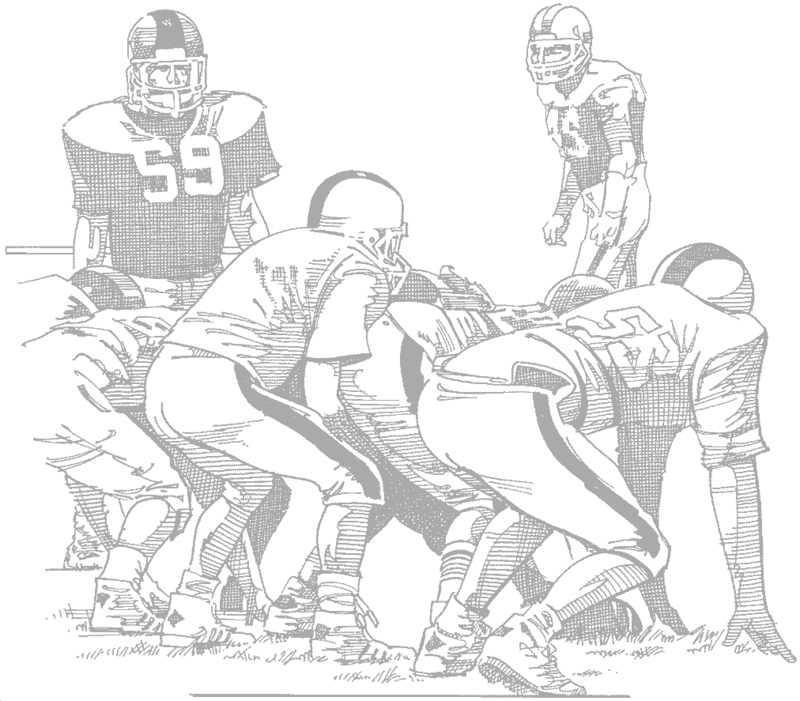 THE OPEN HAND MAY BE USED LEGALLY ON THE MASK. 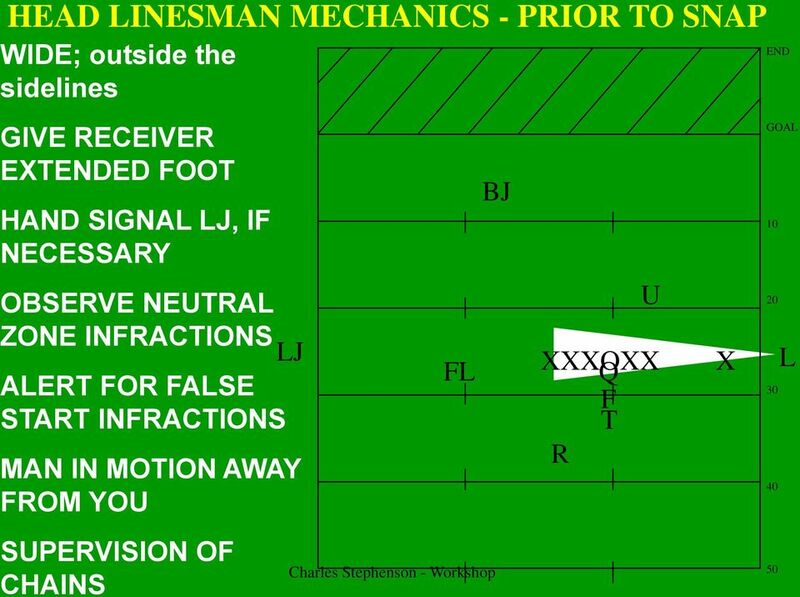 LIVE BALL, BASIC SPOT FACE MASKS 5 YARDS - INCIDENTAL GRASPING 15 YARDS - TWISTING, TURNING, OR PULLING OFFENSE - 15 YARDS BASIC SPOT DEAD BALL, 15 YARDS FROM SUCCEEDING SPOT WHEN IN QUESTION, IT IS TWISTING, TURNING, ETC. 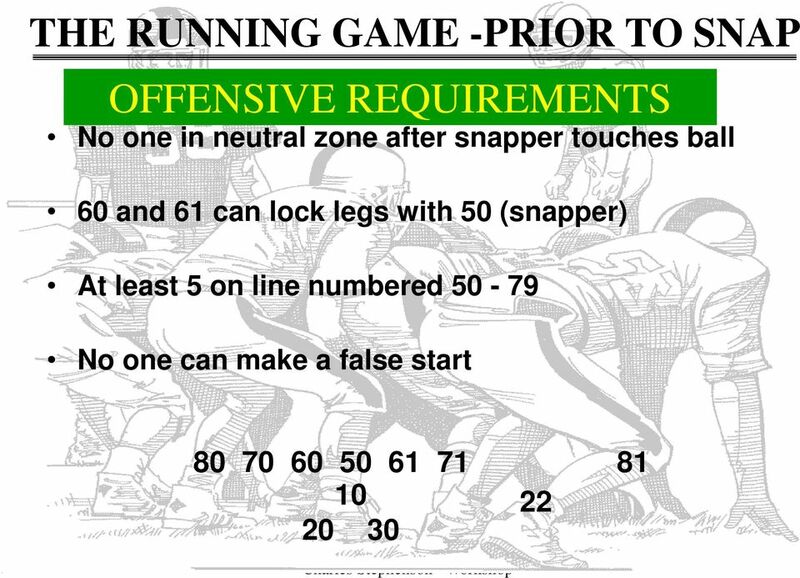 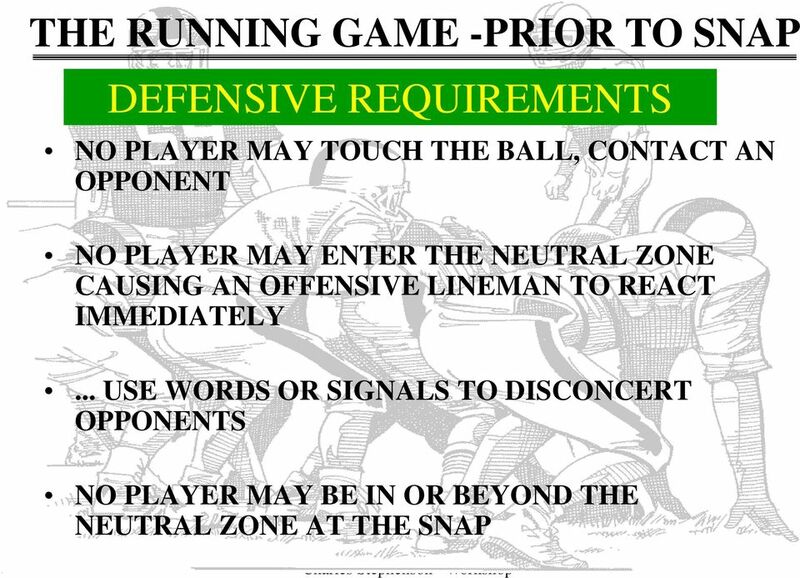 The game is played having a maximum of: (6) offensive and (6) defensive players.